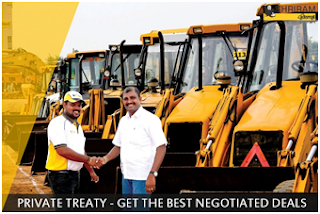 Private Treaty as a platform facilitates negotiated deals for individual & bulk requirement of pre-owned vehicles and equipment. SAMIL offers high-value or bulk asset transaction on this platform and bridge the gap between buyers and sellers. The company ensures to maintain complete transparency at every step of the association and all bids are recorded online. Be it a single vehicle or an entire fleet, we ensures a convenient selection and disposal of pre-owned vehicles andequipment. In this ever-evolving age of competition, we gain an edge through our trustworthy relations with our customers. Once a customer approaches SAMIL for the disposal of his pre-owned vehicles or equipment, the same asset is uploaded on the company’s website which observes a great number of visits & views every day. Customers can easily get In touch with a SAMILIAN to get the best deals out of the box for used trucks and otherpre-owned vehicles anywhere in India. Simply explore the range of available options at bids.samil.in & place a proxy bid to win the vehicle in the comfort of your home. SAMIL is OneStop destination for all used vehicle owners where they can dispose their per-owned vehicles & equipment at the same time you can acquire used pre-owned vehicles at the best price. It offers the widest & the most extensive line up of pre-owned automotives to its customers. It does offer a simple & Do-It-Yourself bidding process where being active is the only way to emerge as a highest bidder. Along with the above mentioned services SAMIL also offers other allied services like new look, refurbishment, parking, documentation etc that makes it a holistic auctioneer for pre-owned vehicles & equipments in India.